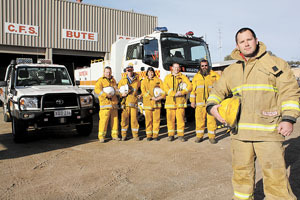 Yorke Peninsula Country Fire Service crews could take cues from the Bute brigade’s recent success. In half a decade, the Bute station has gone from struggling for numbers to the strongest list of any single brigade in the state. “When I started as captain about four years ago we had 10 members, now we have 30 active crew as well as some support staff,” captain, Ben Manners, said. Mr Manners said Bute’s previous captain did a great job for many years, and the brigade has gone from strength to strength since. “It’s going really well, we have good membership and a lot of younger members,” he said.